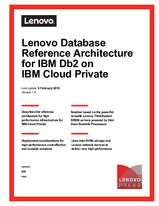 This document describes the reference architecture for the IBM Cloud Private solution. It provides a predefined and optimized hardware infrastructure for high performance implementation of the IBM Cloud Private software. It also provides an example of deploying IBM Db2 package on the IBM Cloud Private. This reference architecture provides planning, design considerations, and best practices for implementing IBM Cloud Private with Lenovo and Intel products. Lenovo, IBM and Intel teams worked together on this document and the reference architecture described herein was developed and validated in a joint engineering project.